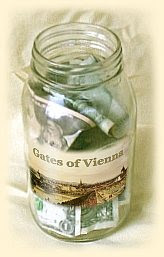 Gates of Vienna: Biased And Proud Of It! Biased And Proud Of It! Dymphna mentioned yesterday that even though we engage in periodic fundraisers like this one, we’re not NPR (National Public Radio). Not only are we uncontaminated by our readers’ tax dollars, we don’t pretend to be unbiased — we’re up front with it. Everyone knows where we stand. No clumsily hidden agendas here. We’re also not the British equivalent of NPR. American progressives can only dream about what the British socialist establishment boasts: a massive state broadcasting apparatus funded by the compulsory extortion of “licence fees” from anyone who owns a television. Our piddling little CPB can’t even begin to emulate the BBC. Compared with the British behemoth, a mere pittance of tax revenue is collected and doled out to our government’s pet leftist propaganda service. The rest of the money has to be dug out of charitable foundations and the pockets of listeners, which makes NPR and PBS less uniform in their promotion of multicultural orthodoxy than their gargantuan cousin across the pond. The British Broadcasting Corporation has been around since the early days of radio, and for decades it held a strict monopoly on radio and television broadcasting in Britain. When I lived in England, the broadcast media were only just beginning to be opened up to competition — there was one independent commercial television network, and all the independent radio broadcasters were “pirate” outfits based in Luxembourg or on anchored ships in the North Sea. Nowadays Britons enjoy the luxury of a multitude of trashy television channels, just like Americans. And yet the BBC still stands, a broadcasting dinosaur sucking most of the oxygen out of the TV news market, peddling its Palestine-loving Marxist agenda and subsisting on the forced contributions of those who loathe it. The current administration in Washington D.C. would dearly love to apply the BBC model to news media here in the United States. Our major newspapers and television network news services are headed for insolvency for a very good reason: most citizens are not interested in the tendentious garbage they peddle, and recognize the leftist slant of the “news” reporting when they see it. Make no mistake about it: Barack Obama would foist the American version of the BBC on us if he could. But it would be a new, improved version of the BBC. It would be cleaner, more progressive, purged of all the independent thinking and reactionary tendencies for which the BBC is so famous. Our readers have been remarkably generous during our current fundraiser. Wednesday was a particularly busy day, with Thursday only slightly slower. The outpouring of support from everybody has made it difficult for Dymphna to get her thank-you notes out in a timely fashion. But be patient: they are coming. Austria, Germany, Japan, the Netherlands, Sweden, Switzerland, and the UK. Our deepest appreciation goes out to all who have contributed. Since we’re not in this line of work for the money, “scraping by” is all we need to do. Thanks to your help, we should be able to scrape by a little while longer.